One of the cool new features in SQL Server 2014 is delayed durability (available in all Editions), which is described in detail in Books Online here. I think I’m going to see a lot of people turn this on, as you can get a profound increase in transaction throughput with the right workload. However, I also think a lot of people are going to turn this on without realizing the potential for data loss and making the appropriate trade off. Why can it give a throughput boost? At the obvious change point, that’s where I enabled delayed durability, with all transactions being forced to use it. Before the change, the number of Transactions/sec is equal to the number of Log Flushes/sec, as each transaction is holding locks that block all other transactions (I told you it’s a contrived workload). So why the profound jump in Transactions/sec when I forced delayed durability? Under normal circumstances, when a transaction commits, the commit doesn’t complete until the log block (see this blog post for more details) containing the LOP_COMMIT_XACT log record for the transaction has been flushed to disk and the write is acknowledged back to SQL Server as having completed, providing the durability of the transaction (the D in the ACID properties of the transaction). The transaction’s locks cannot be dropped until the log flush completes. In my workload, all the other transactions are waiting for the one that is committing, as they all need the same locks, so Transactions/sec is tied to Log Flushes/sec in this case. With delayed durability, the transaction commit proceeds without the log block flush occurring – hence the act of making the transaction durable is delayed. Under delayed durability, log blocks are only flushed to disk when they reach their maximum size of 60KB, or roughly every 1ms, whichever comes first. This means that transactions commit a lot faster, hold their locks for less time, and so Transactions/sec increases greatly (for this workload). You can also see that the Log Flushes/sec decreased greatly as well, as previously it was flushing lots of tiny log blocks and then changed to only flush maximum-sized log blocks. I was forcing all transactions to be delayed durable, but the facility exists to make the delayed durability choice per transaction too (see Books Online for more details). There’s a bit more to the log block flushing too: under delayed durability, a log block will flush when it fills up, or if a non-delayed durable transaction commits, or if the new sp_flush_log proc is executed, or after 1ms. My good friend Aaron Bertrand over at SQL Sentry has a long post about delayed durability that looks into its performance implications in a little bit more depth so I recommend you check out his post as well. Your transactions aren’t durable when they commit. Simple. Now you may be thinking that if the system crashes, the most you’re going to lose is up to 60KB of transaction log. Wrong. If that last log block contains the LOP_COMMIT_XACT log record for a long-running transaction, when the system crashes, and that log block isn’t on disk, that whole transaction will roll back during crash recovery. So the potential for work/data loss is greater than just 60KB. Log backups will not back up that unflushed log block, as it’s not on disk, so non-durable committed transactions may not be contained within a log backup. Non-durable transactions that have committed are not protected by synchronous database mirroring or a synchronous availability group either, as these rely on log block flushes (and transmission to the mirror/replica). For critical transactions, an sp_flush_log can be used, or per-transaction delayed durability used instead. Should I enable delayed durability? It depends. Is your business comfortable making the throughput vs. durability trade off? Does enabling it give a throughput boost? If yes to both, go ahead. If no to either, don’t enable it. That’s a very simplistic way of thinking about it, but that’s what it boils down to really. As I stated above though, I think a lot of people are going to be wowed by the throughput boost (if their workload benefits) from delayed durability and see this as a no-brainer, without considering the potential for data loss. How expensive are page splits in terms of transaction log? Are I/O latencies killing your performance? What would you recommend to get a log flush once per second? Seems not to be build it. Let me make sure I understand – you mean a way to only have a things durable once per second? There isn’t a way to do that. I can see why that might be interesting, but that would involve a lot of caching in memory. Btw, please specify a real name/email when posting in future as I’m seeing you make up random ones from the same email address. I’m guessing the question was inspired by MySQL as there is a setting that can be configured this way (innodb_flush_log_at_trx_commit). Their logging design is significantly different from SQL Server’s, though. For a given databases, or for each database on the instance. Yes, but that’s only useful if your workload is such that there’s a very low amount of transaction log being generated, less than would take to fill up a 60KB log block in one second (minimum time period for an Agent job). Even then, it still doesn’t remove the dangers of data loss, just randomly makes the chance smaller. That’s why I mentioned the job running an endless loop, where the time between flushes would actually be decided by the WAITFOR DELAY interval, which can be as short as 1ms. Not bullet-proof by any means as far as data protection goes, but might be considered as decent in-between arrangement. Does this guarantee that when transaction 3 is written to disk, transaction 1 & 2 also have been written to disk? If so, this might be useful in DataMart loader scenarios. Yes it does, as log blocks are flushed in the order they are created always. Thanks for the info Paul. I believe this is Enterprise edition only. Correct? I believe it’s in all Editions – don’t see anything in BOL that says Enterprise-only. Did you run this test on a system with the log file on an SSD? It would be interesting measure/isolate delayed durability’s impact an SSDs as they use page (their page) sized writes, typically 4-8K much larger than that of an HDD. If log records written are less than block size there’s potential for wasted IO capacity. With delayed durability you’re storing data in larger/fuller pages on the disk. Assume I have turned on Delayed Durablity for transaction T1. T2 and T3 are normal transactions but started after T1. So, does that mean T2 and T3 will be written before T1? 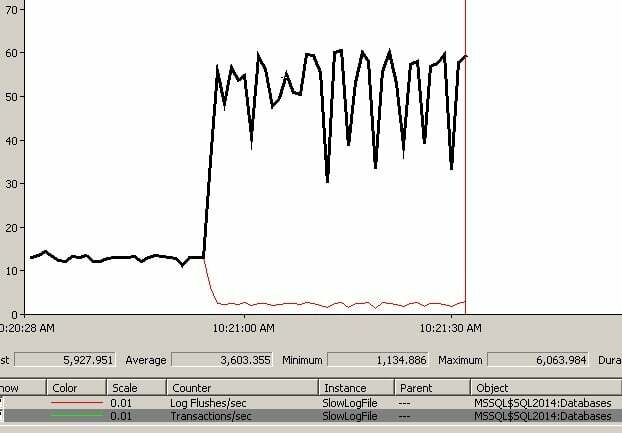 If yes, does SQL Server sort the LSN numbers ( reorder transactions ) while performing recovery? No – as soon as a non-delayed durable transaction commits, the log block is flushed to disk. It’s impossible to reorder transactions – that breaks all kinds of things. Yes – it works with all SQL Server HA/DR features. You need to be careful though, because if the log block doesn’t flush on the primary/principal, it won’t be copied to the replica/mirror, as the log block flush is what triggers the copy. So after a crash, even with synchronous AG/mirror, a committed transaction may not be on the replica/mirror. What happens if you do a commit on the primary with delayed durability (sync replication)? I assume it will wait for the commit on the secondary replicas before it’s committed on the primary. So the bottleneck will be my secondary replica. Or do I have to enable Delayed Durability also on my secondary replicas to prevent this? No – when a delayed durable transaction commits, there is no log block flush locally, so nothing is sent to the sync replica. When a log block flush actually occurs, the local log write cannot be signaled as complete until the log block as been written to the sync replica’s log drive too. Delayed durability cannot be switched on/off on the replicas, as they are read only. If the primary is set to use delayed durability, that setting will be present in the replicas as well, but is not used unless that replica becomes the primary. I.e. the behavior of delayed durability only affects the primary replica for log block flushes and log blocks sends to the non-primary replicas. At a database, recovery model is simple and delayed_durability = Allowed. After running checkpoint command the fn_dblog function shows 3 records. The fn_dblog function shows 6 records!!! And after the service starts, the record was added to the table!!! The log blocks are also flushed to disk every 1ms. Therefore, how to Delayed_Durability causes data loss? If the server crashes before the log block is flushed. 1ms is still a window of time. I know of businesses that have experienced that and had to turn delayed durability off. If the log blocks are flushed to disk every 1ms or (60KB), how Delayed_Durability can be useful? I think it’s not useful. Because log block flushing is asynchronous and on busy systems will be flushed much more frequently than that. Delayed durability set to force will not improve bulk insert performance. It is suitable only for small volume commit. I enabled this in my development environment by using select * into to insert 4 million records. Forced durability took 2 minutes 1 sec to complete the insert where as disabled mode executes in 35 seconds. Absolutely. It’s designed to help workloads with frequent, very small log flushes. Here I blv transaction will get more slow as log will not be hardened on log disk on secondary replica if primary log block is not full. Not quite. The transaction will actually be faster, as it won’t have to wait for the log harden on the secondary copy, as it’s the log block flush which triggers the remote copy. But I wouldn’t use it with sync AG/DBM because if there’s no log block flush, there’s a window where you could crash, failover, and lose data. Very small window but still a window.